Sammy Lee has left the England coaching team and will now work full-time as Bolton boss Sam Allardyce's assistant. New England boss Steve McClaren wants a full-time under-21s coach and offered the ex-Liverpool midfielder the job. He would have worked alongside current part-time under-21 boss Peter Taylor, who is also manager of Crystal Palace. "I'm flattered to be considered for the full-time post but want to show my commitment to Bolton by declining," Lee told the Football Association website. Lee, 47, had also previously been juggling his two jobs, like current U-21 coach Taylor. New England head coach McClaren confirmed: "I've always enjoyed working with Sammy over the past five years but I believe the time is right to make certain changes to the senior team coaching staff. "I hope that I can make the under-21 coaching position a full-time role. I'm currently discussing this with the FA. "With Peter Taylor continuing as part-time under-21s coach alongside his role as Crystal Palace manager, I had discussed the possibility of a full-time role with Sammy. "However, I fully respect Sammy's decision to focus his full attention on his role with Bolton Wanderers and would like to wish him every success in the future." Lee said he had enjoyed his decade with the FA. "It has been a great honour to be involved with such a dynamic organisation," he said. "I would like to take this opportunity to thank the players, both at senior level and Under-21s, who I have had the pleasure working with over the past few years." 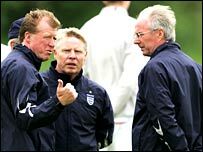 McClaren officially became England boss on 1 August and takes charge of his first match on 16 August - a friendly against Euro 2004 champions Greece. On Friday the England coach is set to unveil his senior team backroom staff, name the new captain to succeed David Beckham, plus his squad for the friendly. Former national coach Terry Venables is expected to be given a role, while Bill Beswick, McClaren's sports psychology guru and assistant manager at Middlesbrough, is also expected to be involved. Meanwhile, Manchester United midfielder Paul Scholes has rejected talk of an international return with England. Scholes, 31, retired from international football after Euro 2004, saying he wanted to spend more time with his family. Scholes spoke to Untied's official website about reports that he may be asked to make an international return.